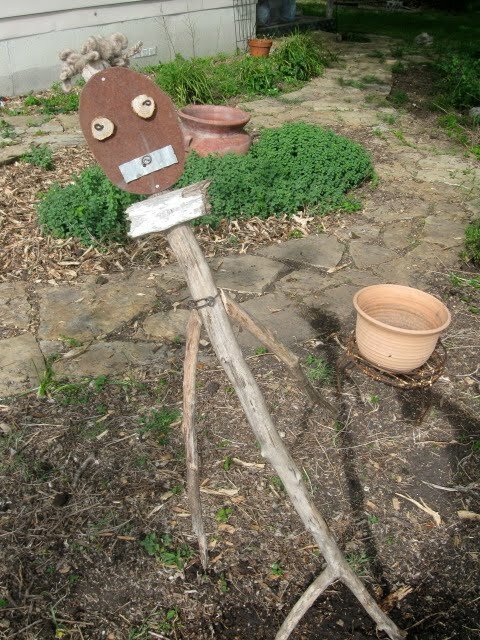 Remember how Gail took sticks home from the farm yesterday? They came back as garden people today. 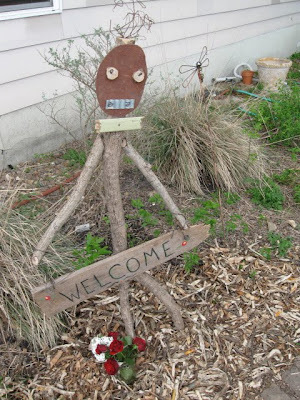 Meet Adam and Eve, who welcome you to the garden. They make me giggle when I come up the walk. Gail has turned her artistic eye to our flower beds, and the result is absolutely enchanting. She pulled up a bunch of weeds, continuing where I left off last weekend. She filled in with mulch and even contributed several plants where we had some bare spots. The chickens have a bad habit of tearing up new plants as soon as they're installed, so we covered them with wire baskets. 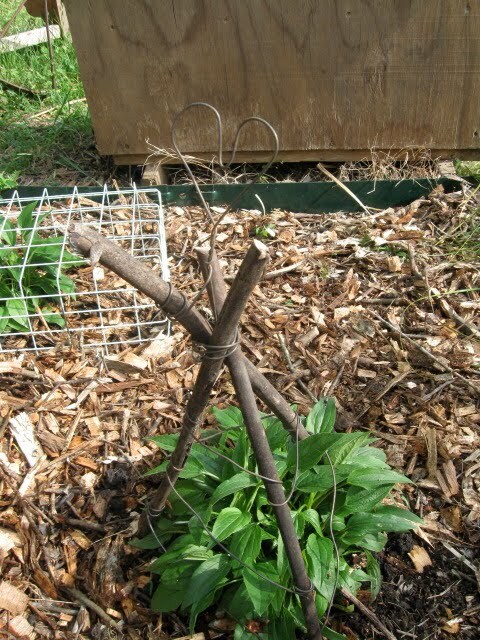 Gail built a stick-and-wire tepee for one of the echinacea plants. Even this utilitarian structure is topped with a wire heart. Big Smile. Now, that was plenty of effort for one afternoon. But Gail had mentioned off hand, that if I wanted my rusty table painted before the weekend, she'd help me get it done. Well, you don't have to poke me twice. I dashed out for textured Rustoleum spray paint and away we went! And snap, it's done! Hot diggity. I'm really wrassling with an interesting issue in my life. I look around this farm and see all these things I'd love to do here, but feel overwhelmed and underfunded in the time department. Then an incredible friend comes over and blows those myths apart. This really is your farm. And that makes me so happy. Love the garden people . . . they make me smile! I Love when people with artistic energy enter our lives and inject some newness - it's motivating and cheering! Why is This Woman in Such Bliss?